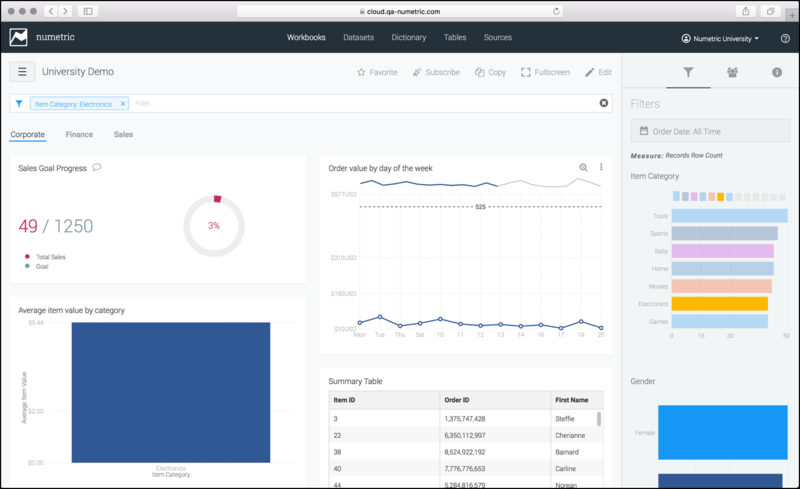 With your Dataset all built out, you're ready to build a Workbook. Numetric Workbooks provide powerful methods of data summarization and exploration. 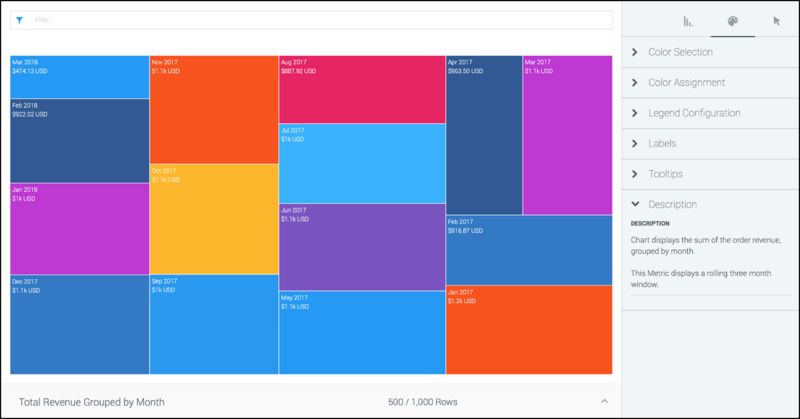 After you've compiled and formatted your data into a Dataset, you're ready to start using Workbooks to visualize and share your data. In Numetric, a Workbook is a collection of metrics that summarize data from one or more Datasets. Workbooks are easy to customize and even easier to read and share with others in your organization. Because of the way Numetric is set up, all of the heavy lifting has already been done. 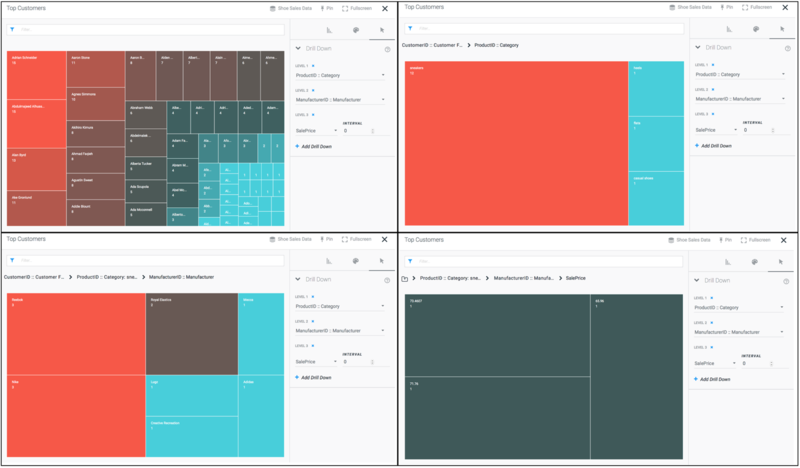 With your Datasets already compiled and indexed, Workbooks can handle large amounts of data, and display charts with on-the-fly filters and drill layers, all without a loading screen or without having to build out a new Dataset. Metrics are the building blocks that make up your Workbook. Each metric draws and displays selected data from a single Dataset. 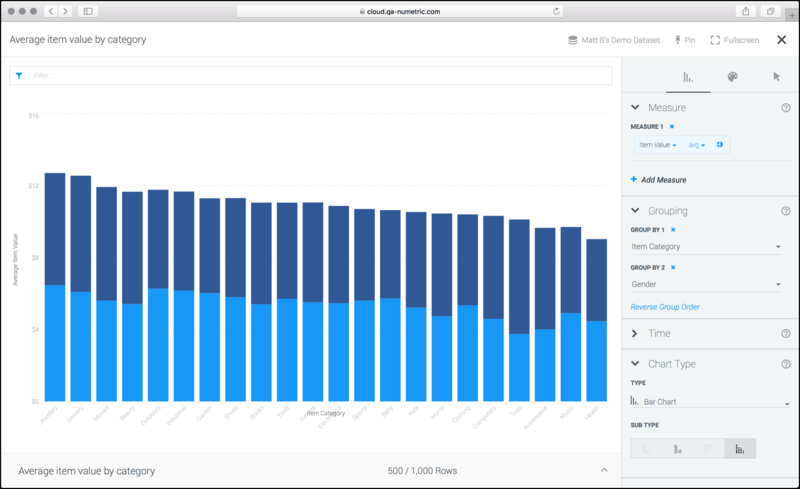 When building a Metric, you can use the Analysis, Presentation, and Interaction sections to display the information you want, the way you want it. 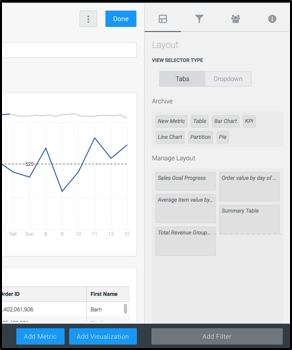 The Analysis section allows you to select the data points and chart type to display in your Metric. The Analysis section is broken into four sections: Measure, Grouping, Time, and Chart Type. 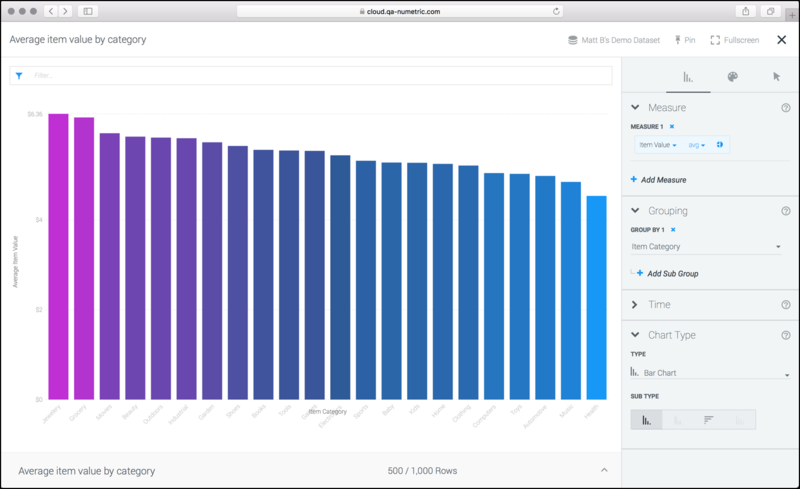 When building your Metric, it is important to understand the difference between a Measure, and a Grouping, as they are the backbone of any Metric. A Measure is simply a column of data pulled from your Dataset and is required for each Metric. 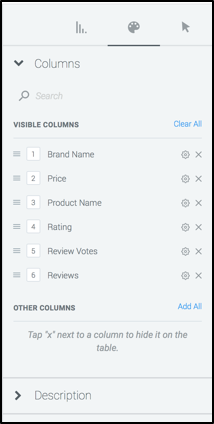 After selecting a Metric, you can tell Numetric how you want the data in that column aggregated. If you only select a Measure and no Grouping, it will display a KPI (key performance indicator), which displays as a number. The default Measure is ‘row count’, this simply displays the total number of rows (not unique rows) in your Dataset. For example, if your Primary Key is ‘customer ID’, a row count will display the number of customers in your Dataset, or if your Primary Key is ‘order number’, a row count will display the number of orders in your Dataset. You can select any column in your Dataset to display as a Measure. When paired with a grouping, a Measure can display more powerful comparative data. 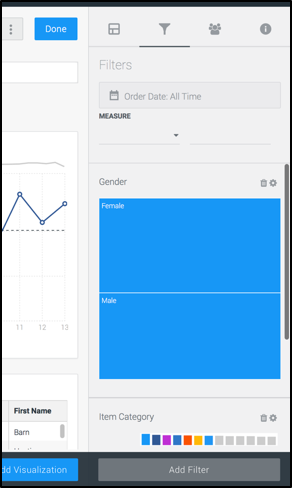 A Grouping is not required to build a metric but is required to display any chart type other than KPI. A grouping provides a second dimension to your Metric. In a traditional vertical bar chart (see below) the Measure is the Y axis (running top to bottom), and the Grouping is the X axis (running from side to side). In the example below, our Measure is ‘Item Value’, and the Grouping is ‘Item Category’. So this metric is measuring the average cost of all items, grouped by the category of items. Each metric may also contain multiple measures or multiple groupings. This can help display correlation between various metrics. The example below contains the same Measure as the bar graph above (Item Value), and the same Grouping (Item Category), however, we added a second Grouping (Gender) and displayed it as a stacked bar chart. So now, we can see the average value of each of our item categories, as well as what demographic of customers are buying them. 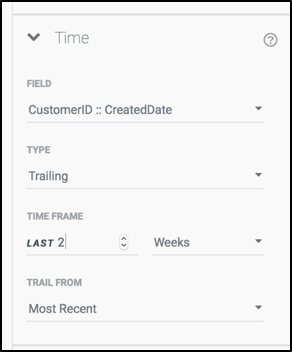 The time field allows for you to customize the date range of data to display. You can select which field to apply the filter, as well as the type and range of the filter. Any filters applied on the Metric level will apply to the Metric in the default Workbook view, however, any filter applied on the workbook level will override the Metric level time filter. 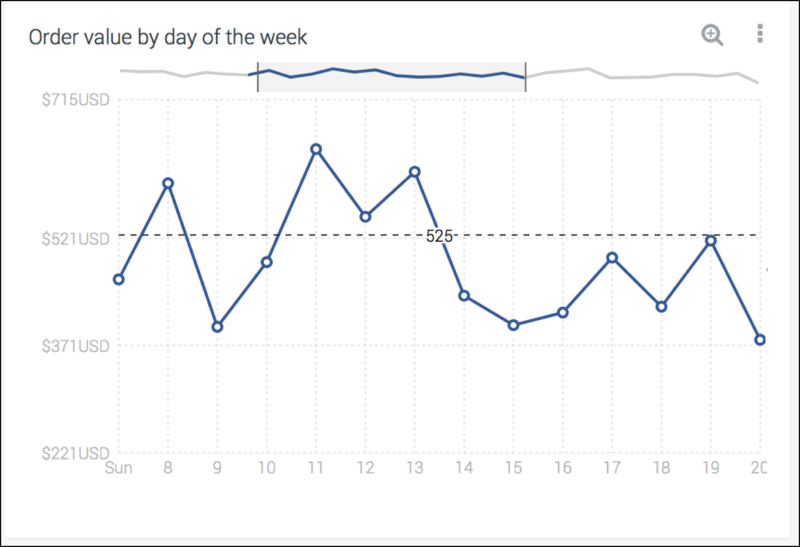 After your Metric is displaying your selected data in your desired chart type, it’s time to make it look and feel the way you want. The Presentation section allows for you to change the color scheme and the labels of your chart. 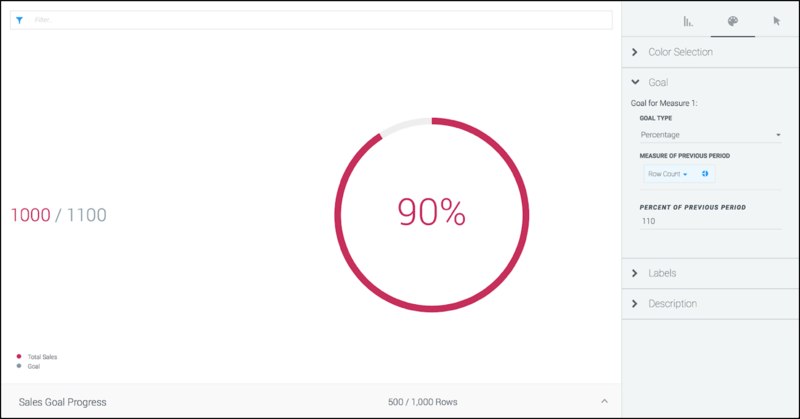 The presentation section is broken into several sections to help with the appearance of your metric. These sections include color selection, color assignment, labels, horizontal and vertical axis (if applicable to the chart type), sorting, goals, tooltips, and description. The Color Selection section allows you to select the color scheme you would like to apply to your Metric. 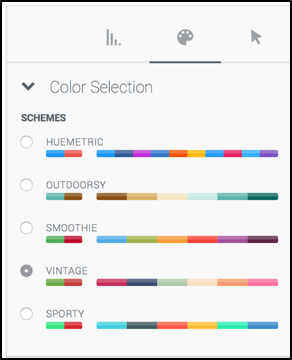 Under the Color Assignment section, you can determine how Numetric assigns the selected color scheme to your Metric. By selecting Grouping from the Color Message dropdown menu, Numetric will assign a unique color to each displayed Grouping. By Selecting Measure you can select an Assignment Type, either Monochromatic (which colors all Measures the same), Sequential (which will allow you to identify two colors, high and low, and Numetric will create a gradient between those two colors for all values between), and Diverging (allows you to select three colors, high, middle, and low, and Numetric will create a gradient between those three colors for all values between). The Columns section allows you to format, order, and add/remove the values for each column in the Table. Each column is displayed under either the Visible Columns or Other Columns heading. All columns listed under Visible will be displayed in the table, all columns listed under Other will not be displayed. You can drag and drop each column under the Visible heading to adjust their display order in the table view. More information on formatting is available in the Metric Label Formatting article. Legend Configuration allow allows you to enable/disable Labels, and Legends for the metric. Checking Show Labels will overlay the unique Grouping header as a label for each segment of the chart. Checking Show Legend will display the unique Grouping header and corresponding color for each segment on the chart. The legend can additionally be displayed on the bottom or left side of the chart by selecting the corresponding radio button under the Layout heading. Under the Labels, and the Legend Labels headings you can customize the label of each measure in your chart. Additionally, you can turn the legend, and measure statistics header on or off by toggling the Measure Statistics, and Legend checkboxes. Note: you can toggle the legend on or off from the Legend Configuration section. Under the Horizontal and Vertical Axis sections, you can change the title of each axis under the Axis Title section and can customize the Axis Labels by toggling the checkbox on and off. By clicking the Settings gear located to the right of the Axis Label checkbox, you can format the appearance of the axis label. The Sorting heading allows you to organize how your Metric data is displayed. You can choose to sort by Measure, Grouping, Column, or Row Count, in either Ascending or Descending sort order. Additionally, you can select the number of values to display in the metric (max of 500). The Goals section allows you to define goals and goal lines that display with your metrics. 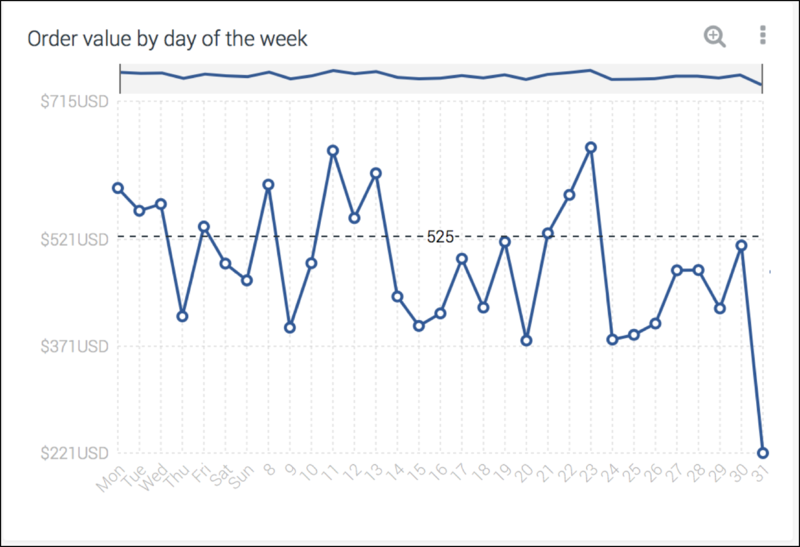 For Bar and Line charts you can set a static value as your goal line. For the KPI chart type, you can select from the following Goal Types: Static, Measure (which allows you to select another measure as a goal), and Percentage (which allows you to select a percentage of another measure as a goal). Under the Tooltips section, you can define custom tooltips that will display when you mouse over a specific point on your Metric. 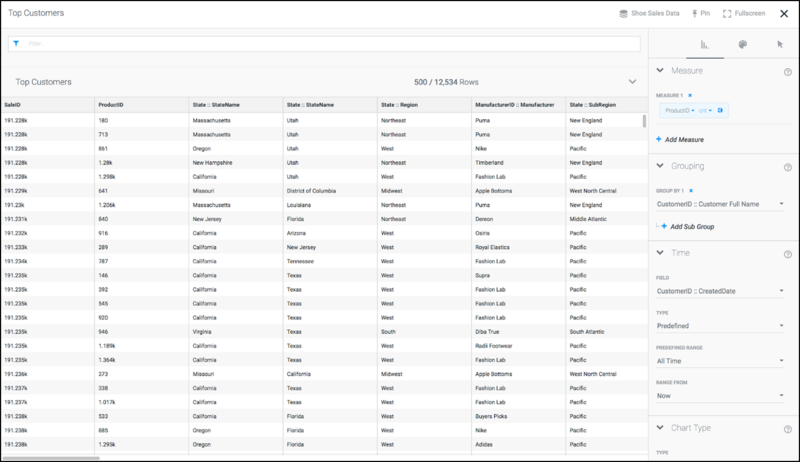 By clicking the + button, you can add a column from your selected dataset to display. Additionally, you may be required to define an aggregation method for that tooltip, and format the tooltip to appear as you would like. Under the Description section, you can create a custom description that will appear next to the title of the Metric when displayed in a Workbook. The Description allows you to include an explanation and description right in the Metric so that everyone who views it will understand the information being displayed. 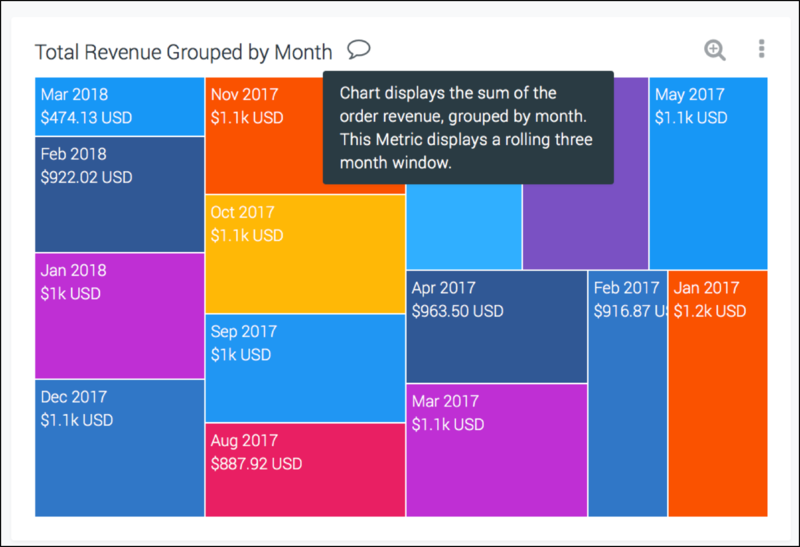 The Interactions section allows you to develop user-focused interactions to make your visualized data more meaningful. Under the Interactions heading, you can define custom Drill Layers to allow further exploration of your data. Numetric allows for you to build custom drill layers to further explore your data. By clicking on an element of your metric (e.g. 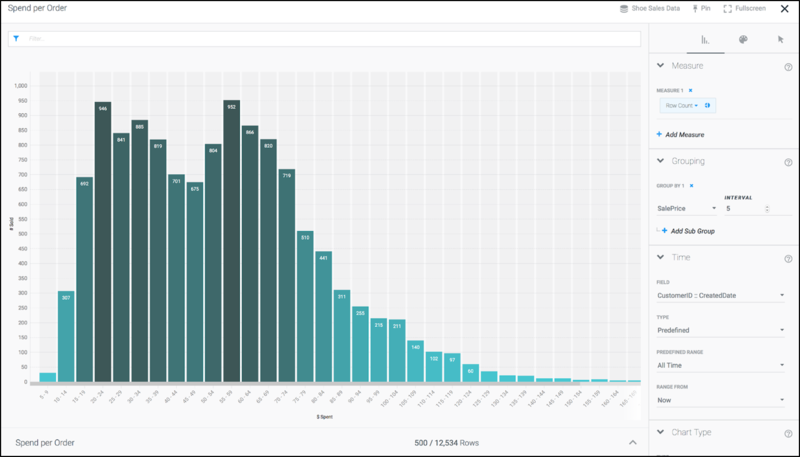 a single bar in a bar chart), it will allow a further exploration of that subset of data. For example, if you have a bar chart that is displaying the number of sales per region, if you click on a specific region, you can set a drill layer that will display the items being purchased in that region. The best part about these drill layers is - you don’t need to re-index or load your data. Just click, and you see your newly adjusted metric. This helps you and your end users understand the ‘Why?’ behind your data with just a click. It is important to note that drill layers only work when viewing a metric individually, or in explore mode. If you click on an element of a metric in the Workbook view, it will actually filter the entire workbook to that element rather than drill down. 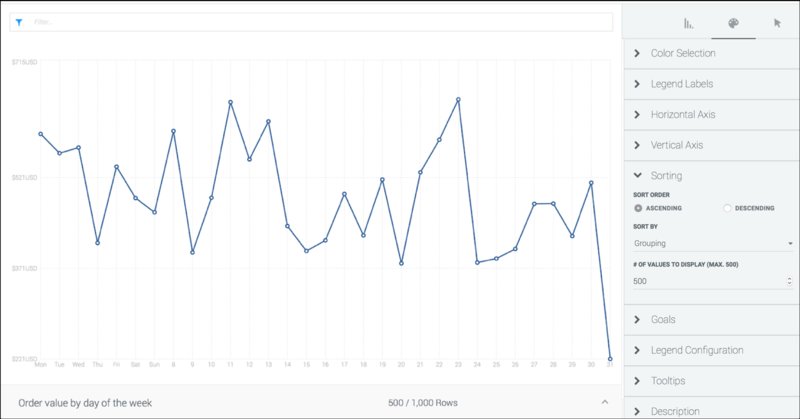 In addition to Metrics, Workbooks also support Visualizations. 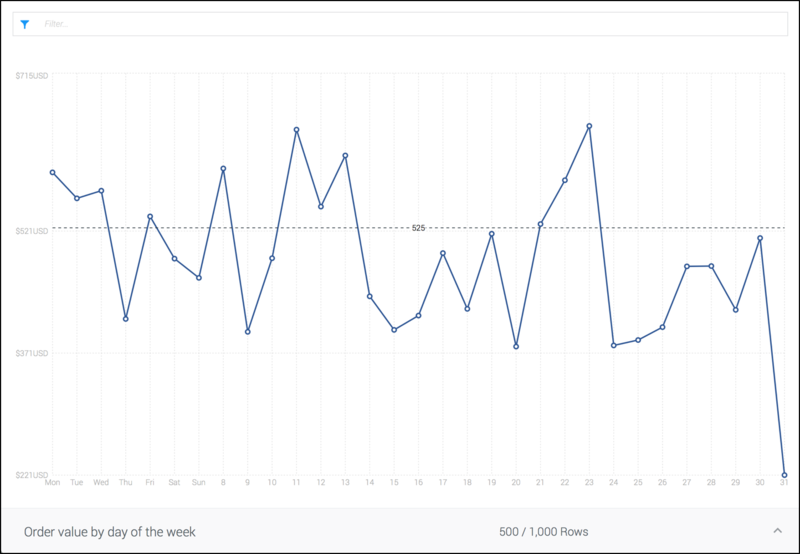 Visualizations are more complex, form of Metrics targeted at Workbook power users. 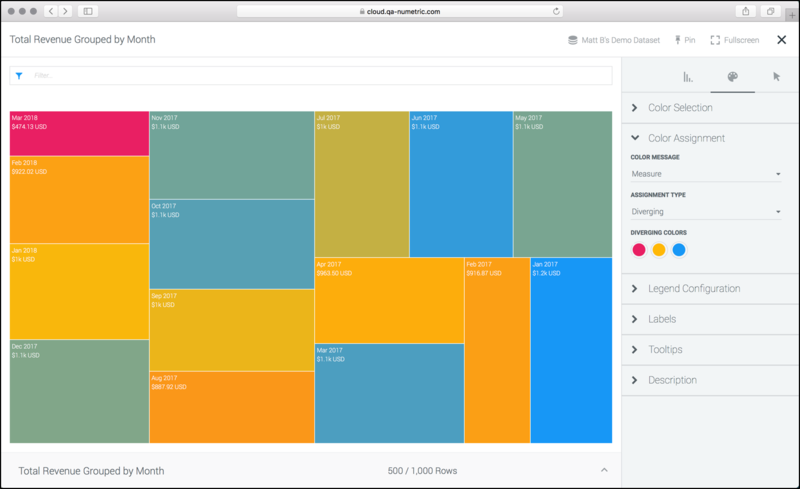 Visualizations allow for more advanced functionality that is not currently available in Metrics, including more detailed filtering, grouping, and formatting of charts. For help using Visualizations please contact Numetric directly. With your workbook built out, and shared with everyone in your organization, you are ready to explore your data. 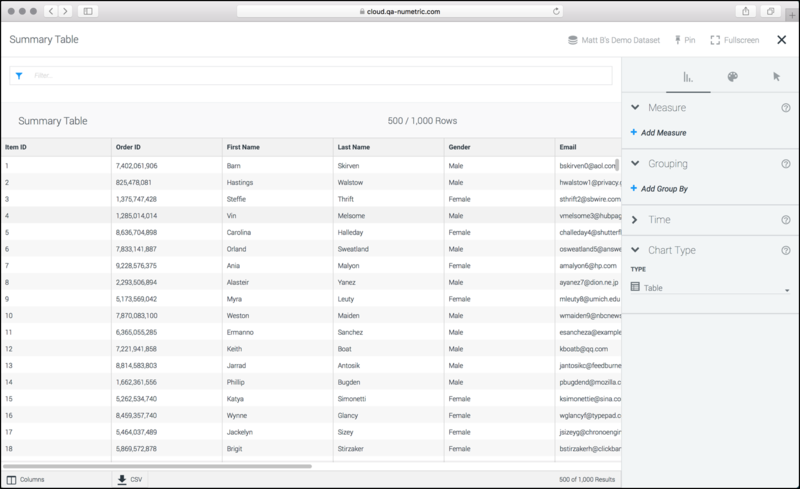 One of the most powerful features of Numetric Workbooks is the ability to filter, explore, and adjust your Workbooks in real-time, with no loading screen or re-indexing of data. When viewing Metrics with large groupings of data, they will display with a Focus Bar, displaying only the data within the focus bar. You can click and slide the Focus Bar to display a different segment of the data. Additionally, you can adjust the size of the focus bar to display more or less of the specific Metric. In the example above we are viewing only a segment of the data whereas in the example below, we have adjusted the Focus Bar to display all of the data within the Metric. Any Metric can be downloaded for offline viewing by simply hovering over the chart name, and clicking on the menu button in the top right. There you will see a Download Chart button, which will download an image of the chart. To download a table chart, click the CSV button at the base of the table. This will download a CSV of the displayed metric. You can also take a deep-dive into a specific Metric by clicking on the title of the Metric. That will open explore mode for that Metric. 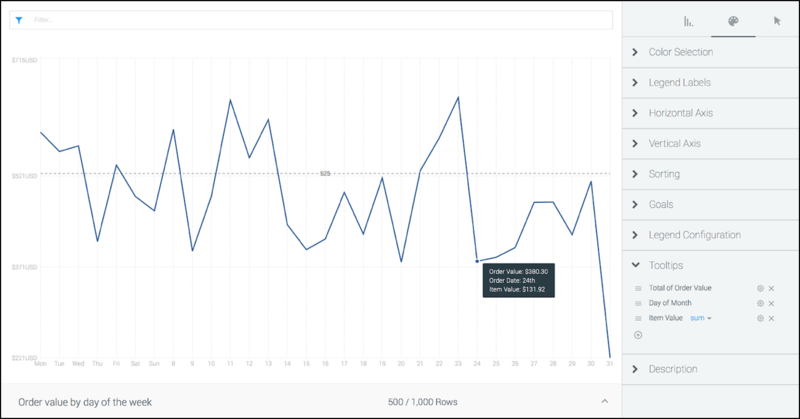 Explore mode allows for you to drill into the data, and see the data behind the Metric. By establishing a drill layer, you can click on elements of your chart, and see more in-depth detail. When in the explore mode for each metric, you can also view the raw data that feeds into the Metric by clicking on the arrow at the bottom of the metric. This will open the Dataset referenced in this metric. 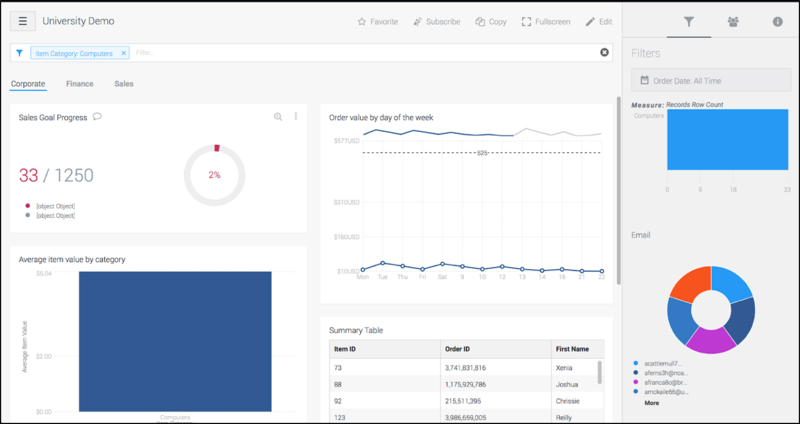 With your Metrics all built and ready to view, you can adjust the layout of your workbook. In the Layout tab (available when in Edit mode for your Workbook), you can resize, and rearrange your Metrics however you would like. To keep the format clean and easy to read each Metric is displayed in a grid. To resize the metric, click and drag on an edge and adjust to the desired size. To reposition the Metric, click and drag the metric to its desired location. These adjustments can be done in the Layout sidebar, or with the actual metric. You can filter your entire workbook by using the filter search bar at the top of the screen, or by using the filters sidebar on the right side of the screen. Note that filters applied on the Workbook level could override any conflicting filters that may exist on your individual Metrics. So if you set a custom filter while building your Metric, it could be undone when applying a filter on the Workbook (the Metric level filter will resume functioning when your Workbook level filters are removed). You can also set a filter to your workbook by clicking on a value in one of your metrics. For example, if you have a chart displaying number of sales grouped by price, you can click on one of the price ranges in the chart and Numetric will filter the entire workbook to display information related to that price range. To create a new filter go into Edit mode, and select the Filter tab. There you can click Add Filter at the bottom of the screen, and a new filter will appear. To customize the filter, click the gear icon to the top right corner of the filter. There you can set the Group, the type of Chart to display for the filter, and the ability to show all or a selection of fields from the selected group. To set default filters for a workbook, click on the fields in the filter to apply them to the Workbook. When the desired filters are applied, click Done. This will save the filters to the default Workbook view. When you are done adding Filters, click the Done button to save your Workbook (note, any filters applied to the workbook will be saved at this time). With your filters added to the workbook, you can now select and deselect your filters as desired. Any selected Filter will apply to all metrics in your Workbook. Additional filters can be found by simply typing a value into the Filter bar at the top of the screen. In the example below, we are searching for “Computers”, which will filter all metrics to display only rows where the item category is “Computer”. You can search for any column in your Dataset that is marked as Visible in the Dataset Column Properties. After your workbook is completed, you can share it with anyone in your organization. This can include edit, and view access as needed. Note that sharing access to a Workbook will also grant view access to any Datasets referenced in the Workbook. 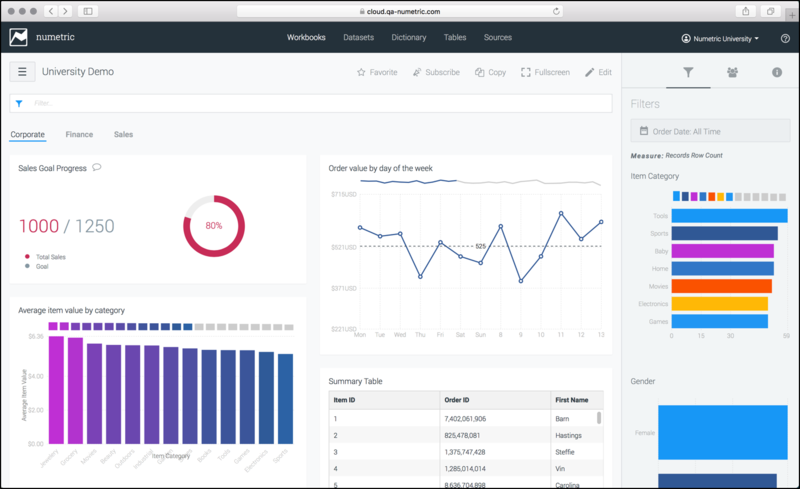 You should now be familiar with all elements of Numetric, from bringing your data over with Sources to formatting Tables, creating Terms in the Numetric Dictionary, creating and managing Datasets, and finally with building Workbooks and Metrics. If you have any questions, please reach out to us, we are here to make sure you have a successful experience with Numetric.